With everything that has been happening around me lately, I'd almost forgotten this trip until this week. The tickets arrived on Wednesday, with a much earlier than planned start time - but since this tour picked up from my doorstep I wasn't too concerned. Did feel sorry for the Exeter contingent of SWRG who had a 04:17 kick off however! So at a little after 05:00, I stumbled rather sleepily onto the platform at Weston, soon to be joined by quite a group of others. 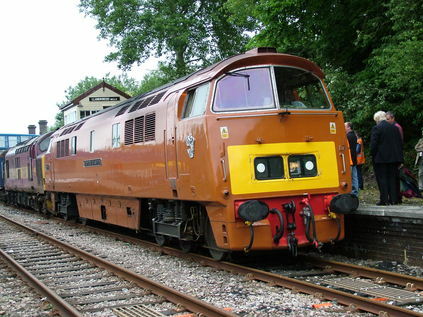 Bang on time, D1015 Western Champion rolled quietly and rather majestically into view. Found myself seated with an acquaintance from Bridgwater and a veteran of Coach C on the recent Whistling Slater tour. We discussed the feeling that you should almost always book on a tour from your hometown, for fear they won't stop them there anymore. Soon afterwards, with all our pick-up stops complete we turned our attention to the Lickey. Despite a sudden loss of speed (unusual as we had a clear road) near Bromsgrove and a load of thirteen coaches, D1015 made slow but remarkably steady progress. On arrival at Birmingham however, we were notified that there was a slight problem with D1015 and that we would be diverted via Bescot Yard with a short delay necessary for an examination to take place. It turned out that a slight crack in one of the turbochargers was leaking coolant. For insurance on the isolated Heart of Wales line, we were to have 37427 tucked inside our train. Not a problem for me - all adding to the novelty of the day, including some unusual track at Bescot and a chance to thoroughly check the numbers in the scrap line! Very good progress from here, despite our lateness. A crew change at Wolverhampton and a swift flypast of Oxley Depot, then some fast running as far as Shrewsbury where we were stopped for some time at Abbey Foregate. Timing now became an issue, with a limited range of passing places on the Heart of Wales, many were speculating where we would stop and for how long. I'm ashamed to say that an early start, a relatively late night and a stressful week caught up with me and I dozed off several times between Shrewsbury and Llandridnod Wells, but as originally planned an extended break for food and leg-stretching was welcome. As ever local fish and chip shops struggled to cope. The town itself is a quiet and attractive Victorian spa with some fascinating buildings. I can't help thinking that an improved rail service would increase the number of visitors here greatly. Off at our revised departure time of 13:30, and through some of the most remarkable scenery in the British Isles, south towards Swansea. More snoozing from me however! We took the rare curve from Hendy Junction to Morlais East Junction and onto the District Line. Once on the mainline we started to run at speed again - despite a faulty barrier at St. George's Crossing. Through Cardiff on the avoiding line, and to our next stop at Newport. Noted 37408 dumped near ADJ yard - rumour has it that 37427 was due down here to replace it following some accident damage. 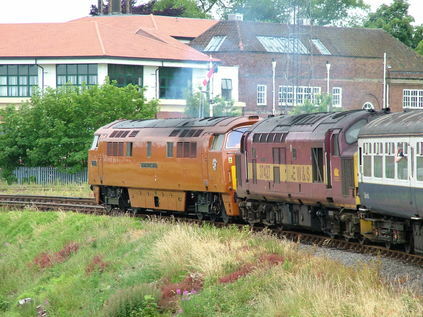 In any case, D1015 disappeared to East Usk for fuel, and to drop off 37427. No problems at all for D1015 solo on its return trip. 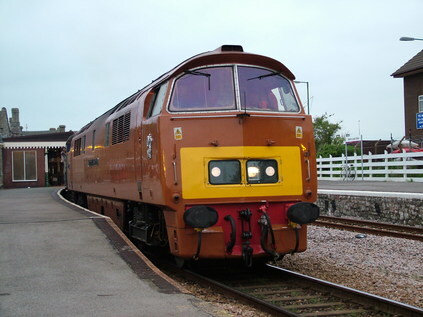 First, up to Gloucester via Lydney and then back via Standish and Westerleigh to Bristol. A little weak sunlight, the first of the day as we left Bristol for Weston. Lots of sleepy but very happy people from the South West aboard for the final fling. 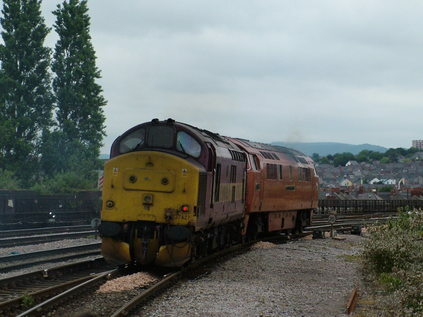 Left them at Weston, and dashed down the ramp for a final shot of D1015 leaving. Despite the problems early on, a successful day.